Why OTA’s in China have a great futur ! 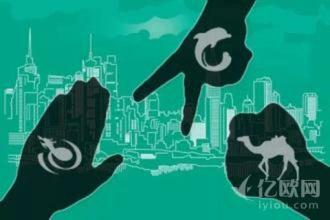 Before starting to explain and detail further information let me start my explanation with two mains ideas that might appeared obvious but are relevant points to understand the situation of online travel agencies (OTA) in China. The first main fact is the booming of digital era, in China there is more than 630 million Internet users, which is representing a huge part of potential customers that has to be taken into consideration. Chinese are hyper connected people, everything is happening through their phone, IPad or others…etc, they are diving deeply into the 2.0 technology. The Chinese market is incredibly growing huge in China and more than 80% of Chinese use their phone to have access on Internet. The second fact is tightly linked to the first point, with the booming of the technology and the consumers behavior change, 90% of Chinese go through Internet to get travel information before starting to purchase flight ticket, hotels booking…etc. The outbound Chinese tourism is always increasing, according to the official press agency in China, last year, in 2014, 107 millions of Chinese travelled abroad, an increase of 20% from the year before. Chinese tourists spent more than 146 billion euros in 2014. According to Boston Consulting Group, in 2030, Chinese tourists may take about 1.7 billion trips per year, meaning double than in 2012 were it was only counted 500 million trips taken. Who are the main OTA’s in China? 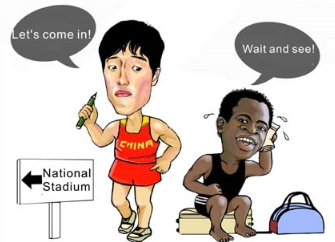 First let’s start with an overview of the situation of OTA’s in China. Here below, you can have a rough drawing of the main player among all these OTA is CTrip. Others: Qunar, Best Tone, Feiren…etc. We will detail briefly below the main OTAs that have impacted the Chinese market. Ctrip was founded in 1999 and it’s one of the biggest online travel agency in China on 3 mains areas: hotel booking, flight ticket booking and travel. It is on the way to become a big player in this field in a world scale. 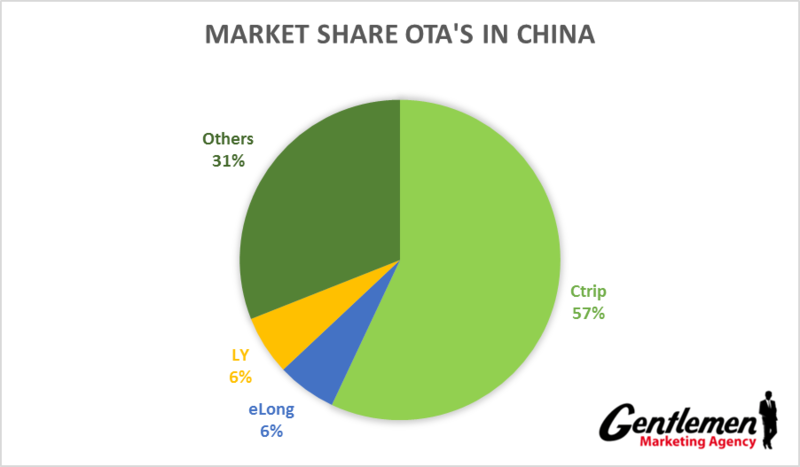 eLong owned with LY the second market share in online travel agency market but as you can see the difference is huge with Ctrip that is owning more than half of market share. Recently Qunar has faced some problems with airlines companies that have decide to stop working with the agency because of too many complaints from customers and clients side. Two years ago, Qunar owned 42% of market share for online airplane ticket but it seems that this event could probably messed up the Qunar reputation. Now that you know more about the main OTA in China, let’s review some changes that happened these time for these OTAs and what is the main consequence following after. The real battle is not really between OTAs but between the giants Tencent, Alibaba, and Baidu (BAT) fighting to get the first place on Chinese tourism market. After that Qunar (belonging to Baidu) has refused to collaborate with Ctrip, Baidu finally decide to cooperate with the giant name of Chinese tourism sector: Ctrip. Some rumors said that Alibaba is really interesting to acquire Ctrip too. Tencent has eLong under its wings but recently Tencent wanted to buy all market shares of eLong in order to have a more effective presence on Chinese online travel industry. Alibaba want to get its part of the cake in Chinese tourism market. With Taobao Trip launched in 2010, this website is offering a large range of services and products with 2 million travel products, with airline ticket from 800 companies. Already about 500 million Chinese consumers have purchased products through the website. We will detail this part into two main segments. The first one is Chinese OTA agencies compared to western ones and the second one is OTA’s trend in China compared to western side’s trend. Online Chinese tourism agencies have an important position in domestic place. However the main question remains, are those agencies can be seen as a threat or not to the western ones? 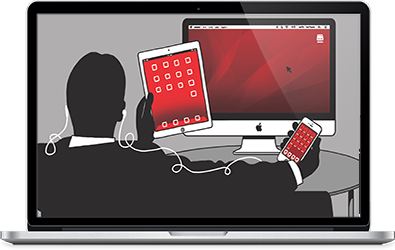 Most of Chinese consumers still rely on the website they know and with the ones they are most common with. International airlines companies know this point, a year ago, Priceline Company wanted to strengthen its position in the tourism area in China. The American company has invested about 500 million dollars in Ctrip, meaning that Priceline own about 10% of Ctrip investment. About 95% of Priceline’s revenues came from hotel bookings. This new collaboration allowed the company to have a larger portfolio of hotel booking in China. At its turn, Expedia sold the major part of its stake to the famous eLong for about 671 millions of dollars. About 60% of Expedia is owned by Chinese travel companies including eLong and Ctrip. Looking at the trend, those airline companies are really aware of the Chinese market trend. In order to succeed to break into Chinese market you cannot impose yourself with strength, you have to come in a smoothly way by collaborating with the companies in place in China. 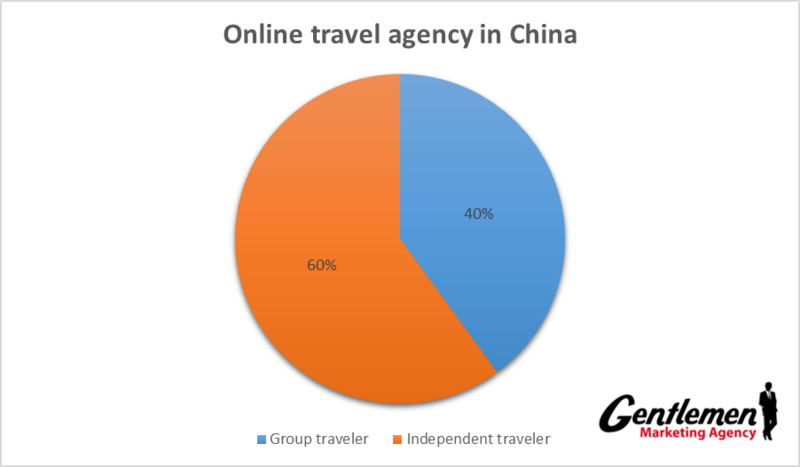 The below graphic is showing that within the OTA’s market, about 40% of the market is representing by the group travelers and 60% by independents travelers organizing themselves their own travelling program. There is a new trend in China, more and more Chinese are planning their trip by themselves because they want to enjoy new experience by their own, meet new people and go to discover the entire world by themselves. Years ago, agency group traveler were dominating the online travel agency market in China. However, the trend tends to be reversed, Chinese consumers find their own interest to travel on their own. The main reason is because Chinese people are really connected people, as said, and especially connected to Social Medias. Weibo, Wechat, QQ and even videos on Youku are really influent tools among Chinese consumers. “When Chinese wants to travel, they search like us , but different tools, their own tools. It is interesting to see that Chinese people has developed their own web system connected to their own language” explained David a Chinese Expert based in Beijing. We can say that the booming of those kind of medias have led to the new trend. Why? 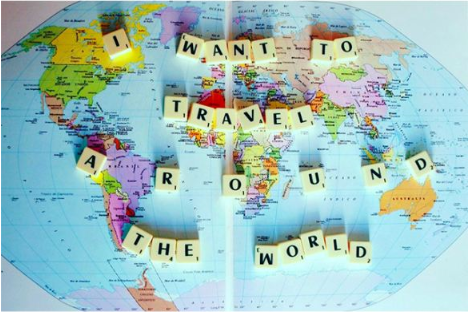 Because through social networks, you can actually share with your others connected friends: tips, plans, pictures, advices and your opinion about your travel experience. To give you an example, one of my friend went to London but I didn’t want to spend so much money and I don’t know where to book my hotel, where to go visit…Well let’s ask my friend who went to London last week, let’s see its post on Weibo and Wechat. How about the western part? In the Western area, this trend came much earlier than in China. People are getting used to travel by themselves, taking their bag and just go all around the world, “bagpackers” are really usual and normal thing in the western part of the world. To conclude our analysis, online travel agencies have a bright future behind them, even if there is a new noticeable trend in China, most of Chinese tourists consumers will still rely on those agencies to plan their travel program or to go with travel agency group. Are you an OTA ? You think of enter into the Chinese Market ? Do not hesitate to contact us and have a conversation with our specialist to know your options. I would like to know how my company can have a constant presence with Chinese Tourists looking to Travel to Canada for a luxury vacation. If travelers want to experience Muskoka, Ontario Canada at any time during the year we have properties that can meet the needs for families, corporate groups or small groups. I am investigating the best way to reach this market and would appreciate your feedback.